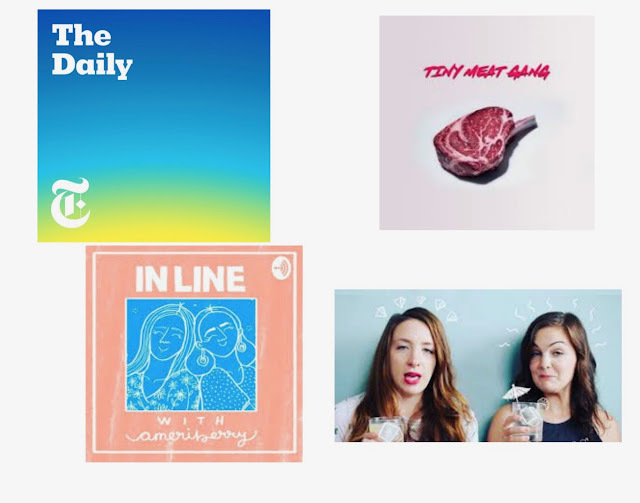 4 Podcasts I Love - emma and co. I'm sorry for writing such a millennial post, but it had to be done. To be honest, I am not the biggest T.V. and movie person and would much rather watch a short online video, read or listen to a podcast (in addition to watching episodes of The Office on in the background). In traveling for work/summer the past couple of months, I have found myself on the Apple podcast app frequently. A good podcast requires a lot of elements to work in unison- a good "shtick," quality guests, engaging topics and a good dynamic between hosts. These are some of my personal favorites- I hope you enjoy them as much as I have! The Daily | This is a podcast produced by the New York Times daily that discusses one major news topic per episode in roughly 20 minutes. The Daily is one of the most popular news podcasts out there, for good reason. The host is interesting without taking away from the journalism- in my opinion, this is the most accessible, interesting way to understand what is going on, and can be done during my commute. TMG Podcast/Insanely Chill | Cody and Noel are hilarious and Cody Ko may be one of the only people I can listen talk for 45 minutes solo about life. This is definitely the guilty pleasure of the bunch, and a great way to block out the world. In Line with AmeriBerry | Pretty typical formula of two friends, Sara and Katherine, who are also recent graduates. I love this one for the topics especially, ranging from consumerism to social media. 51 First Dates | This was the podcast that got me hooked at the beginning of the year. Hosts Liza and Kimmy discuss dating as a late 20's/early 30's woman as Kimmy embarks on going on 51 first dates weekly throughout the year.